Material: Cromargan protect stainless steel matt finish. Rust-free, dishwasher safe, dimensionally stable, sanitary, acid resistant, indestructible and scratch resistant. Design: Daniel Eltner. Design award: honourable mention. A meal often consists of multiple courses - and as a result various pieces of cutlery. The WMF range of cutlery therefore includes starter and dessert spoons as well as the corresponding knives and forks. They are smaller than the classical table cutlery because they make it easier to portion sweet and flavourful dishes. This ensures that the taste buds are not overwhelmed and are delightfully whetted instead. If you are fond of clear shapes, you are certain to appreciate this cutlery: Evoque is straightforward, the transitions from the handle to the front part are harmonious. The knives with an inserted forged blade guarantee long-lasting cutting performance, and the length of the cutlery works especially well with large plates. The balanced material thickness and the rounded edges make them comfortable to hold, and the harmonious proportions provide a good symmetry. An especially attractive feature is the matt shine of the double brushed surface that feels like silk. Forks are more versatile than you might think! Forks are just as much a part of eating as knives and spoons. They are used to shovel, stab and shuffle food. WMF forks impress with their timeless design and top-quality materials. The traditional four-pronged fork has been around roughly since the 1600s. Forks were invented in France and since then have spread around the world. They had a hard time at first, however, because in the Middle Ages the fork was first and foremost a symbol of the devil, something quite hard to imagine these days. Thankfully, though, the fork is today well established as something that no cutlery drawer can be without. WMF forks will win you over with their excellent quality, unique feel and modern linear design. Every fork is made from a top part with the four prongs and a narrow steel shaft used to hold it. Our dinner fork is the most commonly used fork for a main course. It has been in use for around 60 years and is easily distinguishable from starter and dessert forks because of its size and the number of its prongs. 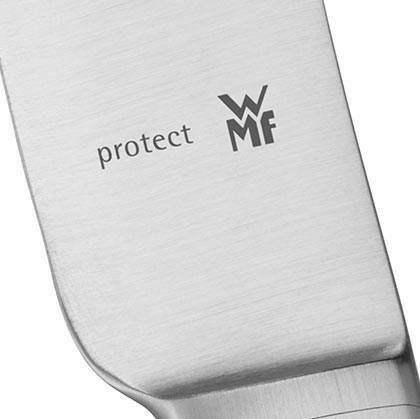 You can buy WMF forks in high-quality and patented Cromargan protect® stainless steel. Cromargan protect® ensures that your forks still look as good as new even after decades of use, because the special alloy and tough material are resistant to scratches and wear and tear. Of course, WMF forks are also available in our very own tried-and-tested Cromargan® 18/10 stainless steel. We also offer 90 g "Perfect" hard-silver-plated forks and forks in 925 sterling silver. You are sure to find the right forks for every table! As well as a range of different materials, WMF forks can also be chosen from several different collections, such as Premiere, Merit and Fächer. 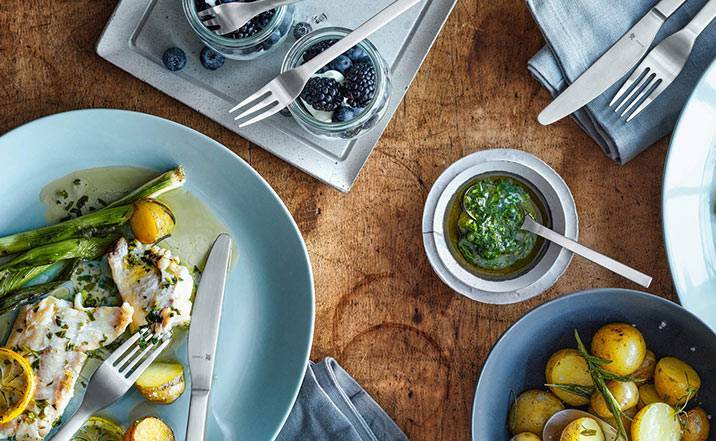 For many of our collections we have placed the emphasis on a timeless design, so that your cutlery will still be adorning your table for many years to come.  The WMF shop is just the right place to go for fashionable collections as well. Discover the wide range of WMF forks for yourself and browse through our online shop.